Add custom interactive diagrams to your .NET user interfaces, including networks, workflows, flowcharts, organization charts, design tools, and more. Flexible, powerful, extensible. Includes many predefined nodes and links. Optional automatic layout & instruments. Supports layers, scrolling, zooming, selection, drag-and-drop, clipboard, in-place editing, tooltips, grids, printing, overview window, palette. Many useful sample applications. ...... different kinds of Pens and routed to be Orthogonal. Predefined node types include Balloon, BasicNode, IconicNode, TextNode, MultiTextNode, BoxNode, SimpleNode, GeneralNode, SubGraph. GoDiagram is 100% implemented in C# as a managed .NET Control. 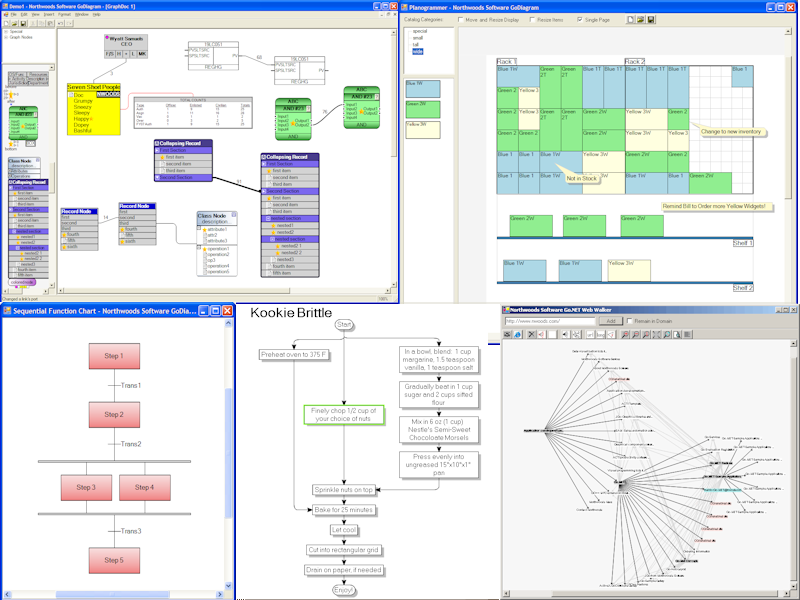 Its Document/View/Tool architecture is very flexible and powerful. Qweas is providing links to GoDiagram for .NET 4.1 as a courtesy, and makes no representations regarding GoDiagram for .NET or any other applications or any information related thereto. Any questions, complaints or claims regarding this application GoDiagram for .NET 4.1 must be directed to the appropriate software vendor. You may click the publisher link of GoDiagram for .NET on the top of this page to get more details about the vendor.